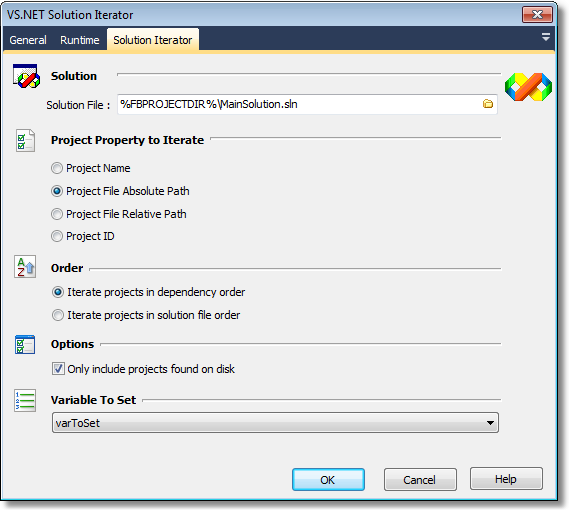 The VS.NET Solution Iterator action allows you to iterate over each of the projects in a Visual Studio solution. For general information about iterators, see here. The path to the solution file to iterate over. You can set which property of the project is used as the value for the iterator. Project Name - Use the name of each project, as shown in Visual Studio. Project File Absolute Path - Use the full path to each project. If this option is used, the project file paths can be used with the MSBuild Project action. Project File Relative Path - Use the path to each project, relative to the solution directory. By default, projects are sorted in dependency order (so that they can be successfully built as they are iterated.) If necessary, projects can be iterated in the order the appear in the solution file instead. By default, if a project file is not found on disk then it is excluded from the iterator. Disable this option if you would like to iterate project files which are not found, as well. Choose a FinalBuilder variable to set for each iteration.